A new study was released by the Consumer Financial Protection Bureau and says senior citizens are being left vulnerable to confusing and erratic financial lingo. As a result, some financial advisors are doing a disservice to them. On Thursday, CFPB provided its recommendations to both the Securities and Exchange Commission as well as Congress. Among them, stricter training for financial advisors who are pitching different financial products to older Americans is strongly encouraged. With at least 50 so-called senior designations, clear enforcement and better oversight is needed for those who provide these services. With such a bewildering array of titles and acronyms, it is no wonder that older Americans are confused and misled by these titles…Today’s report underscores the need for consistent high-level standards of training and conduct for those advisors who want to acquire a bona fide senior designation. The report also says too many times, senior citizens are targeted with the goal of enticing them to different financial products and services, partly because they can afford the sometimes costly products, partly due to their retirement savings, accumulated home equity, inheritances and other assets. They’re also less likely to have high credit card debt and fewer overall expenses. The report also notes that they are often in some degree of “cognitive decline” and as a result, their abilities to manage their finances might sometimes be lacking. One specific example in the report surrounds “free lunch seminars”. Another problem, according to the report, is found the overwhelming and confusing number of acronyms that are often used. These are often similar, which can make it difficult for some to keep up with. It’s also used by less than ethical advisors who capitalize on that vulnerability. Seniors are often overwhelmed from the beginning and are often confused by the fast talk and unclear roles of those pitching services and financial products. During the investigation, regulators discovered that more than half of those offering these services to seniors used misleading advertising efforts. Plus, there were also instances of “unsuitable investment recommendations”; in fact, up to a quarter of the seminars were deemed unsuitable. Others were found to be operating in a fraudulent manner and many did not provide clear insight into the risks associated with any financial products. Still others liquidated, moved or otherwise “hid” accounts without the client’s knowledge. Too many were advertising educational workshops, only to realize they were sales seminars with the seniors the ones being targeted. The report also says it increasingly found large numbers of investment advisers and brokers who market their wares to seniors are little more than “fraud artists” and “swindlers” who are preying on older Americans. They will often refer to themselves as experts in an effort of gaining the consumer’s trust. Also, titles were being used that included words like “certified” and “experts” when in fact, all they’re seeking to do is put forth the impression that they’re either educated or sincerely looking out for the welfare of their clients. Too many times, they’re nothing but marketing ploys. Not only that, but some cities are taking matters into their own hands as well. This week, the St. Clair, Illinois Prosecuting Attorney’s Office of Victim Rights and the Council on Aging is using National Crime Victim’s Rights Week to focus on the challenges and solutions surrounding senior citizens and their finances. 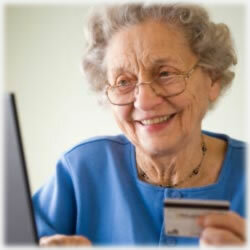 A seminar was held and the many ways elders were susceptible to financial abuse was outlined. Crimes against seniors are significantly under-reported. They like their independence and don’t want to admit they were taken advantage of. During the seminar, there were speakers who highlighted the many was seniors are separated from their money including one scheme where a fraudster duplicates the Internal Revenue Service website and sends a message that says someone will get “x” amount of dollars if they fill out the form. Too many times, the victims, usually older seniors, unknowingly provide their personal information, including their social security number, while filling out the fake form. It’s an easy mark for these criminals. The counties also work with case managers that provide assistance in many different ways, including securing senior housing, lessons in financial literacy and how to deal with family members that steal either money, credit cards or identities from the older members of the family. These efforts go a long way in communities; unfortunately, due to budget constraints, many municipalities are unable to conduct these types of seminars for their residents. Volunteer agencies often do what they can, but they too find themselves with trying to do so much with so little. At a minimum, though, some say even preparing a newsletter of sorts with different tips and recommendations, along with important phone numbers older consumers can use to protect themselves is a great start. Does your community offer any of these seminars or resources? If so, let us know. We’d love to pass it on, especially considering the CFPB’s latest report.